How to Find what you are looking for! Effective Search Techniques! edit>>> Just so everyone dosent think I just went nuts. The above was a test run. reason I did it was to find an easier way for new players to find info in forums. the search function does not always lead to the information easily. so with the help of those who have posted info about stuff in here we can make a list of subjects that are asked about on a regular basis.And make an easy way to find it. This way you just tell the new tester search that word/sentence..
could also make an index here or another place..
Its an idea and will need some refining. ps: doesn't your space button work also? try looking up in forum using gold. Hooking stealth doesn't really count. He is ALWAYS posting in new topics. Problem we have is a lot of new players ask same questions..
and we tell them to use the search option. so they type in how do i get gold or how do i do this or that. they look up "how do i get gold" and get every post with how and gold in it after telling them you cant use words less than 3 letters. and then it doesent use the remaining words together. tell them to search for "getgold" " adjustjoystick" etc..
what we have to do is now go back to our posts on how to do this and edit in a key phrase like "getgold" "buypremium" etc. this way they will be able to find the info because telling them to use the search feature just frustrates them. if you dont belive me just try it and see how long it takes to get the info you would need. 1. makes sense and i can reply. (mostly to say "please use the search function"
what is the model of your joystick? I have tried to use the search like many people in chat rage at you to do when you have a question and more often than not I get a post that has absolutely nothing to do with what I'm trying to find out. So yes it is very frustrating to new or returning players. Thank you for figuring out a better way to get people in the right direction Vac_mo. im sure it will be a help. I too have experienced this problem, so very good point Vac_mo. If new players are going to be told to search forums for answers, then the best way to search it should also be explained. As a writer of industry specific accreditation programs, I see that the biggest mistake instructors make is assuming pupils already know a certain amount. Establish how much they know and make sure the basics are covered so that the initial immersion is not confusing. I use google for searching this and the Wot forums. It works on 2 and 3 letter search terms. 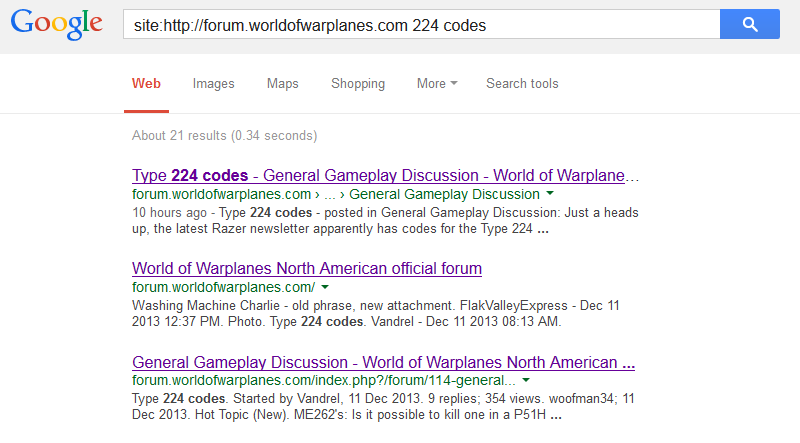 In the Google search type: site:http://forum.worldofwarplanes.com and then your search query. Why arent any help topics pinned on any section of this forum? The tutorial doesn't explain anything! And people tell me to use the search?? Cant the admins produce a topic like Q&A?Im losing interest in this game because the lack of information! And we i try to test something all i got is a plane raming my plane.